Sunday was our first full day of counting, and we started to get the system down, though that doesn’t mean it’s a piece of cake. There are plenty of obstacles to weave over and around while still keeping an eye on your colleagues (we wirk in teams of 6), and not losing count…oh, and managing two clickers, to count the black-footed albatross separately from the Laysan! 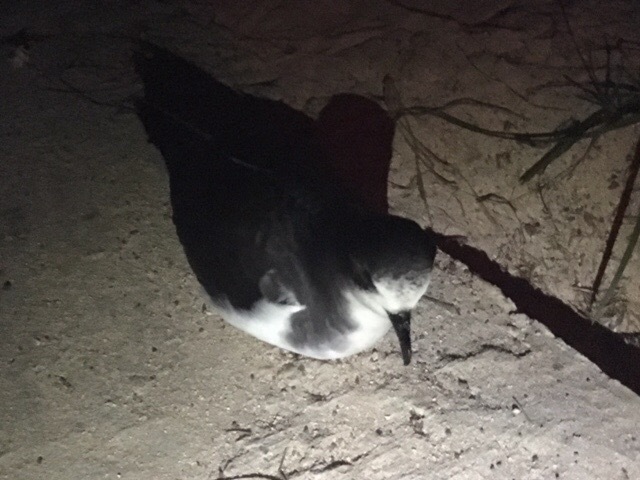 …and then there are the Bonin petrels! These petrels are a success story for Midway! Their numbers had been decimated by the growing rat infestation; but, since the rats have been eradicated from Sand Island, the Bonin numbers have rocketed upwards. Good news for the Bonin’s; not so much for us! Their burrows are so numerous, and have undermined the soft earth and sand, that they can collapse under the weight of even an albatross…so you can imagine the effect when a team of humans comes tromping through their territory! The burrows are impossible to avoid. Every time one of us collapses a burrow, the rest of the team has to halt and wait for that person to dig out the burrow, to ensure there isn’t a trapped petrel (or two!) in it. So, the counting is very much a stop-start process but, with a strict discipline and good communication along the line of counters, it’s a surprisingly efficient and accurate method. Later in the day we covered a sector beyond the runway near the shoreline. 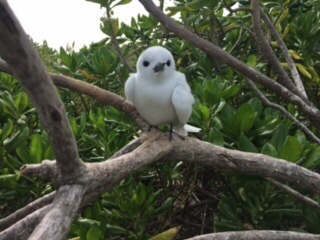 I was hunting for nests in a thick growth of naupaka when I came across a white tern sitting on a branch. It seemed to have no fear of me and made no attempt to move from its perch. With those huge round black eyes, it’s hard to beat them for cuteness! ** I’ve tried since Sunday to load a couple of very small photos and post this, but no luck. I doubt if I’ll manage to post anything further until mid-Jan when I return to Kaua’i (since Midway posts just aren’t worth much without photos), but I’m keeping notes so then maybe I will post retrospectively. In the meantime, to all a very good night! Tx for the post Louise. Have fun. Be safe. Merry Christmas!